A portrait of a marriage and of a woman whose passion and commitment has inspired generations of Americans to seek a decent future for all people. ...a thoroughly researched and immensely readable account ... Cook does a stirringly sensitive job describing the core beliefs that gave 'ER' strength even in the war's darkest days ... Readers will encounter in these pages an intimate, touchingly human Eleanor Roosevelt – an icon they can both admire and genuinely like. ...the Eleanor Roosevelt who inhabits these meticulously crafted pages transcends both first-lady history and the marriage around which Roosevelt scholarship has traditionally pivoted ... is her Sisyphean labors on behalf of refugees, many of them Jews threatened by the Nazi killing machine, that make ER heartachingly relevant. Cook fleshes out the generally accepted perception of Roosevelt as more progressive than her husband, more eager to preserve the best of the New Deal (even as war loomed) and to foster a more egalitarian and inclusive society ... For the most part, Cook skims quickly through Eleanor's later years, almost as though tiring of her subject. But her discussion of the former first lady's encounters with the 'crude misogyny' of the men in the U.N.'s U.S. delegation is vivid. 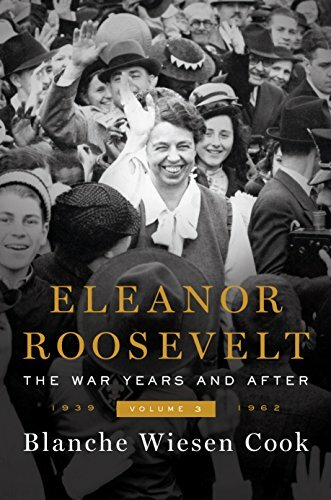 What did you think of Eleanor Roosevelt, Volume 3: The War Years and After, 1939-1962?